Blend all sauce ingredients together in a bowl and set aside. Refrigerate until ready to use. Stack individual portions of 6 slices turkey ham, 1 slice pineapple, and 1 (.5 oz.) slice cheese on parchment lined sheet pan. Heat at 350°F for 6-7 minutes until ham is hot and cheese is melted. Split and lay out ciabatta rolls. Spread a #40 scoop yogurt sriracha on the tops of rolls. 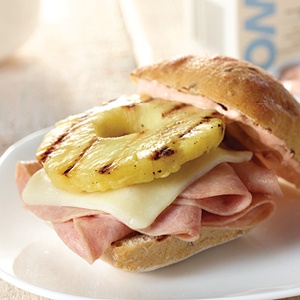 Place a portion of hot ham, pineapple, and cheese on bottom half of each bun and then cover with top half. Place sandwiches in a warmer and hold at an internal temperature of 140°F until service. Cheese, Swiss or mozzarella, LMPS, sliced, .5 oz. 1 serving provides 2½ oz. meat/meat alternate and 2 bread/grain. Greek yogurt, plain, non-fat 1 qt. 2 c. 3 qt. Sriracha sauce 1 1/2 tbsp. 3 tbsp. ALL NATURAL UNCURED TURKEY HAM SLICED 0.5 OZ 9 lbs. 6 oz. 18 lbs. 12 oz. Cheese, Swiss or mozzarella, LMPS, sliced, .5 oz. 1 lb. 9 oz. 3 lbs. 2 oz. Ciabatta rolls, whole grain, 2 oz., sliced 50 ea. 100 ea.